the first round from John's tank. fired from my brother's M26 tank. The pictures on this and preceding pages were taken by an Army frontline photographer, Sergeant Jim Bates. The top picture was taken shortly after the Mark V was hit with the first round of 90MM fired from my brother's tank. The first round hit the Mark V at the base of the gun mantelet and deflected downward, penetrating the hull and severing the legs from the tank commander. 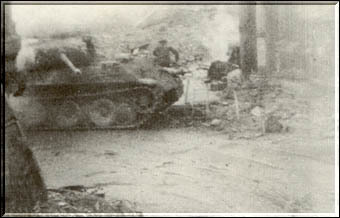 The rest of the crew escaped the tank, one of which can be seen in the top photo, running from the Mark V. All had been hit with shrapnel and died within minutes of leaving the Panther. The next two rounds of 90MM struck the Panther in the flank, penetrating into the tanks interior and exiting through the other side, setting the tank on fire in the process. 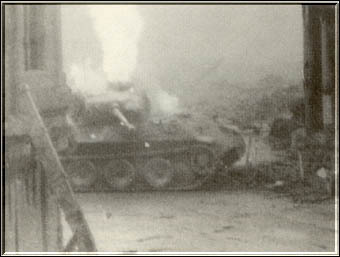 The Mark V Panther burned for two days. Just a little of the revenge for lost comrades. It is worth noting that my brother's tank did not fire at the German crewmen that exited from the carnage. My brother and fellow crew members figured that if the Germans survived that first hit, they deserved to fight another day. Maybe the Mark V in the picture is the same Mark V that fired their high velocity 75MM at my brother. The Panther's faith, as pictured here, is a rather nice turn of events, at least in my book it is. The invincible Nazi war machine was not so invincible after all. Fortunately for all of us, we had brave men like my brother and his fellow crewmen to prove that very point. They fought bravely and with unquestioned devotion and dedication to their country and to the task of keeping us free. I am one person that will never forget the horrors of what they endured and the sacrifices they made to keep us free. As I typed this, it suddenly dawned on me that just maybe there is a chance that the Germans running from the destroyed Mark V and their fellow crewmen were honorable men. Maybe they had no other choice, but to fight. I guess there are always those that are forced to do something that they don't wish to do. One thing is for certain, they were someone's son, brother, husband, or father. Maybe we should have a little pity on their souls. After all, they were human and unfortunately for them, they were fighting for the wrong reasons. They were destined to lose. 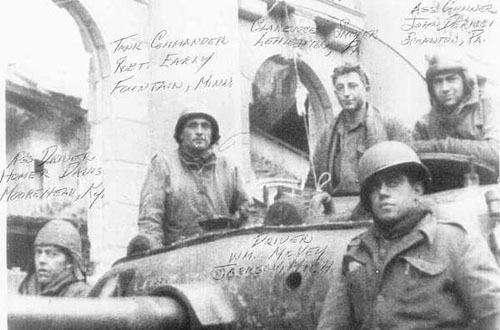 At 1700 hours, on March 6, 1945, an officer of the Third Armored Division reported that his men had reached the Rhine River. Cologne, the heart of the Rhineland, was completely in the hands of the Americans. I am sorry the brave men of the allied forces had to endure what they did and I'm sorry that there are those among us that do not have a clue as to what World War II was about. I am very proud of you John. I am proud of what you and your comrades did for all of us and I am proud to say, "That's John, He's My Big Brother..!"